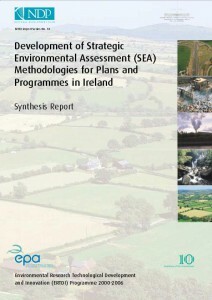 The aim of the Strategic Environmental Assessment (SEA) Directive (2001/42/EC) is to ensure that the environment is taken into consideration in the development of plans and programmes, and before their adoption. Eleven sectors are listed under Article 3 of the Directive and an SEA must be carried out on plans and programmes in these sectors. The sectors are: Agriculture, Forestry, Fisheries, Energy, Industry, Transport, Waste Management, Water Management, Telecommunications, Tourism, Town and Country Planning or Land use. BEC Consultants’ wide experience in terrestrial, freshwater and marine species and habitats means we are well-placed to provide ecological support in carrying out SEAs for plans and programmes across Ireland.